Bitcoin Cash [BCH] saw yet another significant price increase, days after the coin rose by a whopping 18 percent against the US Dollar. 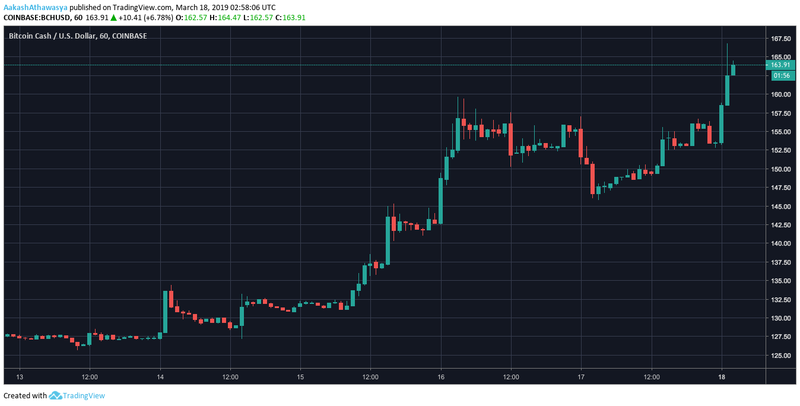 On 16 March, Bitcoin’s [BTC] breach of the $4,000 mark saw the collective market surge, shooting past the $140 billion mark, with top coins in a sea of green. At press time, another bullish wave had taken over the market. After trading at a stagnant price of under $130, BCH prices soared to above $160, for the first time in over two months. Despite market correction forces stepping in and pulling the prices down to $149, the bulls struck again. The bulls pushed the price above the $155 mark within 12 hours of the fall. At 0130 UTC on 18 March, the coin broke the $160 mark yet again, and breached the $166 mark. At press time, the coin had gained by 9.28 percent against the US dollar, and was trading at $165.48. Bitcoin Cash valuation has soared since the bulls struck the market, adding over $500 million in the first cycle. After peaking at $2.81 billion on 16 March, market correction had pulled the coin’s market cap to $2.63 billion. However, the coin defied the odds, and pushed up again, breaking the $2.9 billion mark by 0100 UTC. The market cap reached as high as $2.94 billion, its highest point since it broke the $3 billion mark on 3 January. At press time, the market cap of Bitcoin Cash stood at $2.92 billion, ahead of Binance Coin [BNB] by just under $700 million, and behind EOS by over $500 million. P2PB2B dominated the Bitcoin Cash global trading volume, accounting for 6.29 percent via the pair BTC/BCH. Other prominent exchanges were Huobi Global, ZBG and IDAX, holding 6.05 percent, 6.02 percent, and 5.18 percent of the BCH trading volume, respectively. The post Bitcoin Cash [BCH] pumps by 9% as market’s bullish wave continues appeared first on AMBCrypto.